Note: You will need a rooted Nexus 7 and ClockworkMod Recovery flashed on it. Step#1: First of all download the Android 4.1.2 Jelly Bean (JZO54K) from this link. Step#2: Locate it directly under /sdcard on your device’s storage. 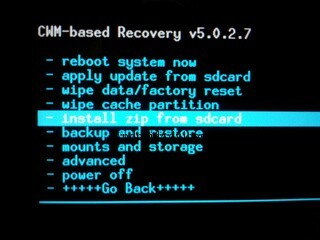 Step#3: Now reboot your Nexus 7 into ClockworkMod (CWM) Recovery. Step#4: At this point, select the “install zip from sdcard” option and then choose the file you located into your device in Step#2. Step#5: Now leave the rest on ClockworkMod. Once done, choose “reboot system now” from the main menu interface. Upon following the above guide, your Nexus 7 will boot into Android 4.1.2 Jelly Bean (JZO54K). If you are not sure, you can simply head over to the Settings > About and check for the software version.